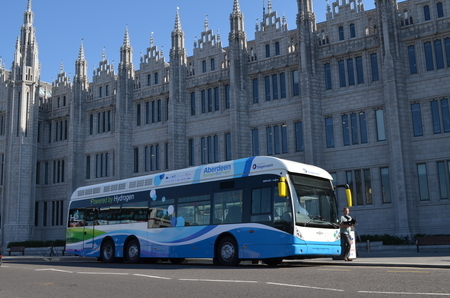 The Fuel Cells and Hydrogen Joint Undertaking (FCH JU) has supported a range of initiatives in recent years designed to develop hydrogen fuel cell (FC) buses to a point where they can fulfil their promise as a mainstream zero emission vehicle for public transport. Their benefits, such as convenient driving range and reduced air and noise pollution, are becoming widely known to bus operators and public authorities. With the aim to facilitate further deployment of FC buses, the FCH JU has published a new study on “Joint procurement of fuel cell buses.” The study supported 90 different European cities and regions in understanding the business case of fuel cell bus deployment and identified a potential demand for over 1,500 vehicles across these locations. The study analyses the funding and financing for fuel cell bus deployment to make them become a mainstream zero emission choice for public transport providers in cities and regions across Europe. It also outlines possible solutions for further deployment of FC buses beyond the subsidised phase. On the hydrogen supply side, offers are emerging that could give an attractive economic and practical solution to bus operators. Taken together, these developments imply that fuel cell buses could be the most cost-effective zero emission option on certain routes, and could therefore become the preferred choice in cities legislating against diesel-fuelled vehicles from the early 2020s. Increased scale, both in terms of bus order numbers per manufacturer and fleet size per depot, will be crucial in realising these targets, as will continuity of demand as this is needed to bring about economies throughout the supply chain. Hydrogen Denmark, the Danish industry association working for improving the framework conditions for hydrogen and fuel cell technologies in the green transition, has recently released a report on user experiences from driving hydrogen-powered vehicles in Denmark. The report is the first of its kind, focusing on the overall user experience - from driving to refuelling. The result of the report is straightforward: there is a big satisfaction among the drivers of fuel cell electric vehicles (FCEV) in Denmark. All users highlighted the driving range, the green profile and the reduced noise as the main advantages of the FCEV. The report is available (in Danish language) here.